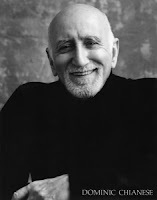 Many of you may know him as “Uncle Junior” on the hit HBO TV Series The Sopranos, but in the long term care community, we can begin to recognize Hollywood star Dominic Chianese as a true quality care champion. Chianese, who is currently cast in HBO’s Boardwalk Empire and starred in The Godfather Part II, Dog Day Afternoon, and All the President’s Men, among other films, visited the AHCA/NCAL offices last week to promote his foundation, Joy Through Art. Chianese has always been a long term care advocate, and told AHCA/NCAL staff about his experiences as a young child visiting the “poor homes” in New York. In these homes, Chianese later found his calling – bringing people joy through acting, singing, and entertainment. Inspired by the emotional reaction of the residents to his interactive performances, Chianese decided to dedicate much of his personal time to performing and promoting the arts in skilled nursing care centers through the Joy Through Art foundation. Joy Through Art strives to improve the quality of life for residents in skilled nursing care centers through regular interaction with performers. Because residents are typically unable to travel outside of their facilities to attend events, Chianese and his partner performers bring the stage to the residents. The Joy Through Art foundation hires professional artists to visit patients and residents on a regular basis. The routine interaction with art, music, and acting, coupled with the participatory atmosphere, allows residents to feel the support of their community and engage in vibrant activities. In a Provider Magazine interview, Chianese describes his passion for bringing joy to nursing home residents and his desire to preserve a legacy through the Joy Through Art Program. For more information on the Foundation, please visit the Joy through Art website. Spring is also a good time to get up-to-speed on trends in the long term and post-acute care world. If you’re looking for the latest statistics on changes in the industry, or if you just want to see data for your state alone, the AHCA Research webpage is a great place to start. 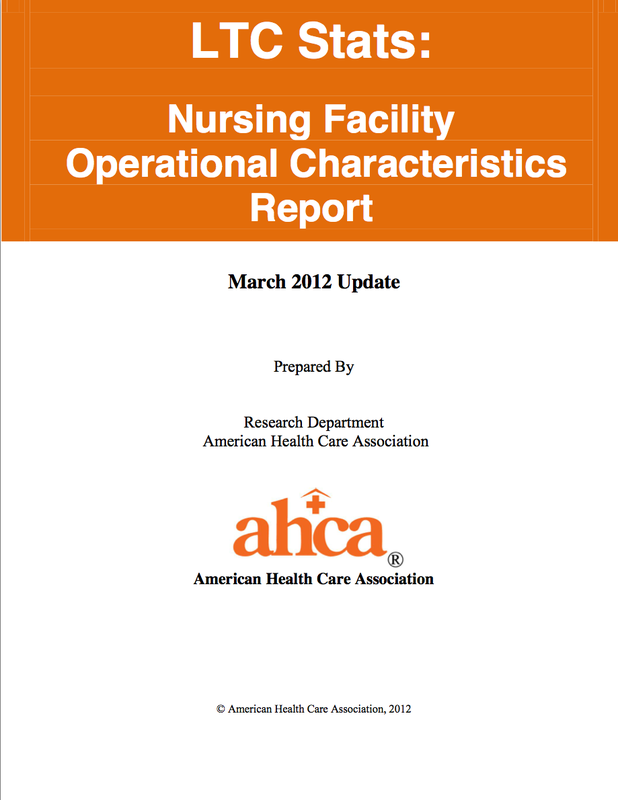 Those wanting a bird’s eye view of trends over time should look no further than AHCA’s Nursing Facility Trend Reports. These statistical reports are based on available information using standard Medicare and Medicaid certification surveys from the Centers for Medicare and Medicaid Services (CMS). The most recent reports for 2012 include Trends in Nursing Facility Characteristics, which shows trends for selected patient and operational characteristics, and Trends in Nursing Facility Standard Health Survey Citation Reports, which feature trends in nursing facility survey results. • Nursing Facility Patient Characteristics – includes the number, Activities of Daily Living (ADL) dependence, and medical condition of patients in nursing facilities. 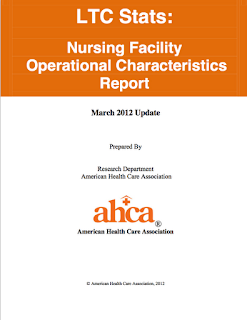 • Nursing Facility Operational Characteristics – highlights ownership, certification status, occupancy rate, and direct care staffing. • Nursing Facility Standard Health Survey (FTAG) Reports – features the most frequently cited health survey deficiencies, the distribution of the scope and severity of deficiencies, and the highest scope and severity citations. • Nursing Facilities’ Standard Health Survey Results Citation Report – includes the number and percent of facilities cited for all health survey related deficiencies (F-Tags) at the national and state level. • Nursing Facility Life Safety Survey (KTAG) Reports – shows the most frequently cited life safety deficiencies, the distribution of the scope and severity of deficiencies, and the highest scope and severity citations. In addition to viewing the latest long term care research reports, AHCA members can take their organization’s data a step further with Long Term Care Trend Tracker. The free member benefit allows facilities and state associations alike to aggregate and compare their data online, which can help when making budgeting and operational decisions. This week the U.S. Senate Special Committee on Aging met to find cost effective methods for providing long term care services. Committee Chair Senator Herb Kohl (D-WI) stated, "we're going to have to do more with less" (federal funding) because it "simply won't be there." The committee listened to panelists' testimony on a number of ideas for stretching dollars in the long term care system. The assisted living community is now very established and provides valuable housing and services options to about 750,000 seniors across the nation, including about 140,000 receiving assistance from Medicaid. Assisted living has provided innovative, quality services for over three decades in “person-centered” environments before that phrase was popular. In addition, assisted living is more affordable than most other long term care settings. Specifically, Kyllo pointed to a CMS proposed rule that seeks to define Medicaid Home and Community-based settings. Instead of increasing savings, the rule would increase costs. As proposed, the rule would eliminate assisted living as an option for low income seniors and could force 140,000 seniors out of the assisted living communities where they currently reside and receive care. As Kyllo points out, such a move would not save costs but significantly expand them by increasing state and federal Medicaid spending. Assisted living leaders have been watching the proposed rule closely since 2011, calling it “A Perfect Storm” for low income seniors and the providers who care for them. NCAL members will continue working with the Senate Aging Committee and CMS to develop definitions of community-based care that are resident-centered and allow seniors the maximum range of long term care choices, including assisted living. Beginning today, the series will delve into the lives of three multigenerational families who are doing their best to juggle demands unique to the “sandwich generation,” or those individuals who face the double challenge of providing for both aging parents and growing children. According to the Pew Research Center, over 50 million families are coping with these growing demands by consolidating households and combining as many as four generations under one roof. The series gets at the heart of an issue that millions of Americans face: how to choose the most appropriate care setting for their aging loved ones. Those in the long term care community understand this issue uniquely and agree that home is the best place for a loved one to age—if home is where the best care can be provided. However, not all families are able to handle the acute needs of their loved ones. And for these families, skilled nursing care centers can provide solutions. In addition to long term care, skilled nursing care centers can provide a variety of short-term care options as well. Respite care allows family caregivers to take a break from their duties to get some much needed respite time themselves. And care centers also provide short term rehabilitative care, helping millions of individuals regain the strength they need to return to their homes and communities. Care center staff know that caregiving is both a physically demanding and emotionally rewarding experience—in fact, staff work so closely with individuals that they end up feeling like family. As baby boomers age and families face increasingly complex care situations, the long term and post-acute care profession will continue to provide care options, professional insight, and innovative solutions for quality care. There’s no shortage of leaders in long term care, and AHCA/NCAL has been cultivating the next wave of national leadership since 2004. That’s why we’re excited to announce the newest members of the “Future Leaders of Long Term Care in America,” AHCA/NCAL’s program that prepares outstanding candidates for leadership positions within the AHCA/NCAL family. After a competitive review process, 33 long term care professionals have been selected from various backgrounds in long term care. These individuals not only exhibit outstanding leadership characteristics in their states, but show great potential for national leadership positions. Over a 12 month period, members of the new class will go through a curriculum based on the latest theories and practical applications in quality management, customer satisfaction, and leadership. In addition to convening at AHCA/NCAL’s Future Leaders Symposium in June, participants will complete personal and organizational strategic goals and plans; read four to five books over the year; and participate in quarterly conference calls. You can see a full list of the new class and read more about the program here. One of our favorite times of the year happens every May beginning on Mother’s Day. 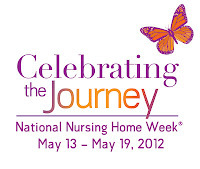 This year’s National Nursing Home Week (NNHW), a nationwide celebration of the people who live, work and volunteer in America’s 15,000 nursing homes, is all about the journey. Since the first NNHW in 1967, nursing home staffs have rolled up their sleeves to make the week a special time for residents, patients, families and friends. Activity directors have come up with events to bolster excitement, local media have spotlighted unique residents, and lawmakers have recognized the week in proclamation letters, opening ceremonies, and salutes. After 45 years, we still call it National Nursing Home Week, even though many nursing homes are now referred to as skilled nursing or post acute care centers. Nowadays, there are as many variations on the name as there are states. 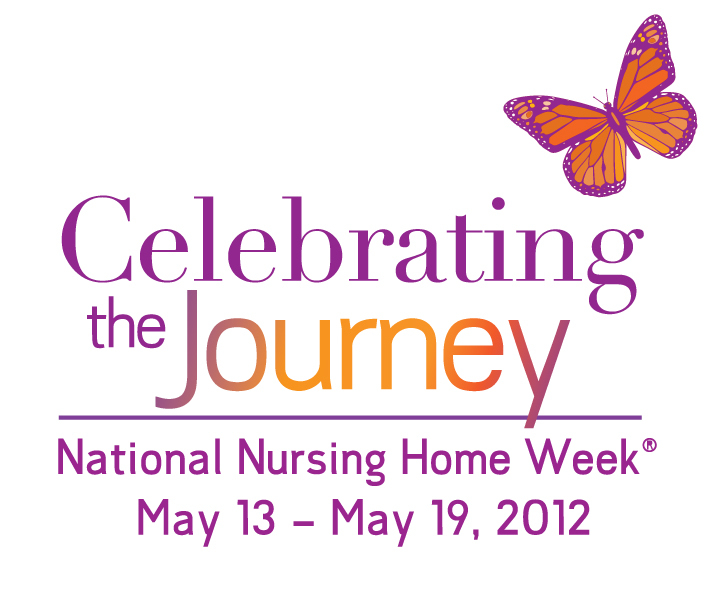 So why hasn’t the name changed to National Skilled Nursing and Post Acute Care Center Week? Ask anyone what a skilled nursing care center is, and you’re likely to get a blank stare. Ask that same person what a nursing home is, and they’re likely to tell you a story about a friend or loved one in a nursing home. While those in the profession know that nursing homes have evolved to be more like short-term places of rehabilitation than long lasting homes, the general public is often unaware of this change. Changing a decades-old perception takes time, research and work. That’s why AHCA/NCAL launched its Public Education and Communications Campaign (PECC) to change deeply rooted perceptions and bring the public up-to-speed with current day practices. Part of that effort is creating an environment where it’s easy to talk about loved ones and the care they’ll need as they age. Check out Care Conversations to join the discussion yourself. Nursing homes have come a long way over the years, and NNHW is a perfect time to challenge those old perceptions where they matter – in your local community. Check out nnhw.org for a number of resources to make the most out of the week, and see what others are doing on the NNHW Facebook page. What do you think about the term nursing home? Would you change it if you could? While things have slowed down in DC, spring is a busy time in most states. With short legislative sessions coming to a close and long sessions reaching their half-way point, AHCA/NCAL state affiliates are working around the clock to ensure that providers have the resources they need to care for our most vulnerable population. We’ve heard from numerous states about their ongoing efforts to battle Medicaid cuts or restore funding, and the results are impressive. Arizona had a double win for providers during their session. Just last night Governor Jan Brewer signed into law House Bill 2526, which authorizes the state to implement a provider assessment fee (AKA quality assessment fee or bed tax) to all providers. Put simply, the assessment will allow the state to generate additional revenue and federal matching funds for Medicaid to more adequately fund care for patients. The Arizona Health Care Association was also successful in passing House Bill 2560, which will remove automatic attorney fees under the Adult Protective Services Statute, thereby diminishing the profit motive for inappropriate and unwarranted litigation in long term care. New Mexico gained $8.1 million in general funds and, with the Federal Medical Assistance Percentage (FMAP), a total of a $26 million increase in the state’s Medicaid budget for long term care. With an approximate $200 million Medicaid base, this equates to more than a 10% increase, a huge win for New Mexico’s facilities and their residents. Through their efforts to raise awareness about New Mexico’s chronic underfunding of Medicaid, the New Mexico Health Care Association (NMHCA) worked alongside Governor Suzanna Martinez to include the $8.1 million appropriation in her budget, which was earmarked exclusively for skilled nursing centers. Learn more about state wins for long term care in Pennsylvania, Florida and South Dakota in Governor Parkinson’s monthly video address to members. What were the successes for seniors in your state? 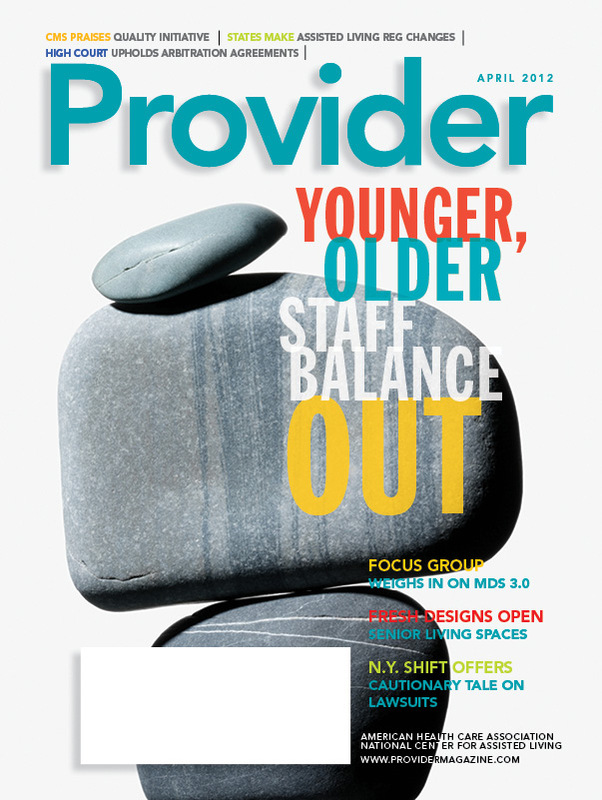 If spring is a time for renewal, the April issue of Provider Magazine has all you need to get up to speed on changes in the industry. It’s no secret that the long term care workforce aging, and this month’s cover story shines a spotlight on how providers are contending with this issue at the facility level. Contributing Editor Joanne Kaldy looks at how providers are finding creative ways to balance the age gap that exists among direct care staff. Researchers at Vanderbilt University have looked at the issue and found some commonalities and differences between younger and veteran nurses. Get the full picture beginning on page 24 of the print issue. In this month’s Congressional Profile, Rep. Patrick Meehan (R-Pa.) tells Senior Editor Patrick Connole why changing the way reimbursement is calculated is a good idea for seniors and providers alike. As Connole reports, the freshman lawmaker is keenly aware of the challenges that exist for the sector. This month’s Focus on Caregiving centers on the timely topic of the MDS 3.0 and its new psychosocial requirements. A focus group study of the changes found concerns with time management due to the frequency of assessments required, interdisciplinary coordination requirements, a lack of training on care area assessments and care plans, and inconsistent responses to the Section Q: Return to the Community questions. Lastly, New York State has recently changed its Public Health Law and thereby opened the door for more litigation against providers. In our Legal Advisor column, Andrew Bart explains the new amendments and offers tips for a defense strategy. Read more on these topics in the April issue and share your thoughts online. When it comes to nursing home administration, we like the analogy of Marcia Flesner. She likened running a nursing home to running a small community. Ms. Flesner, a clinical educator at the University of Missouri’s Sinclair School of Nursing, was commenting on a resident and family satisfaction survey, which found that nearly 90 percent of Missouri nursing home residents and their family members are satisfied with the residents’ long-term care facilities. The study was funded by the Missouri Department of Health and Senior Services regarding resident and family satisfaction in nursing homes. If the analogy was carried further, one could say that a nursing home satisfaction survey is like “voting” in a small community – people vote based on bread and butter issues like services, environment, planning, caring, compassionate staff, etc. “The findings paint a positive picture that contradicts previous perceptions,” said Sinclair’s Professor Marilyn Rantz. "These are great results,” said Jon Dolan, Executive Director of the Missouri Health Care Association. "Providers and frontline staff have been working hard to improve satisfaction under the current regulatory and reimbursement climate," Dolan observed. Reaching and sustaining a quality, highly satisfying environment takes dedication, determination, and commitment. To advance the profession, AHCA/NCAL recently launched a quality initiative challenging members to improve customer satisfaction, reduce rehospitalizations and lower off-label use of antipsychotics. For more information, visit AHCA/NCAL’s Quality Initiative website.